Temer also said he was crafting measures to reduce some tolls and establish minimum freight rates, key demands by truckers whose shutdown has brought much of the country to a halt. Congress this week was also expected to debate various measures aimed at ending the shutdown. Rio De Janeiro: Brazilian President Michel Temer announced a handful of measures today aimed at getting truckers to end a crippling strike that has had a wide impact in Latin America’s largest nation. 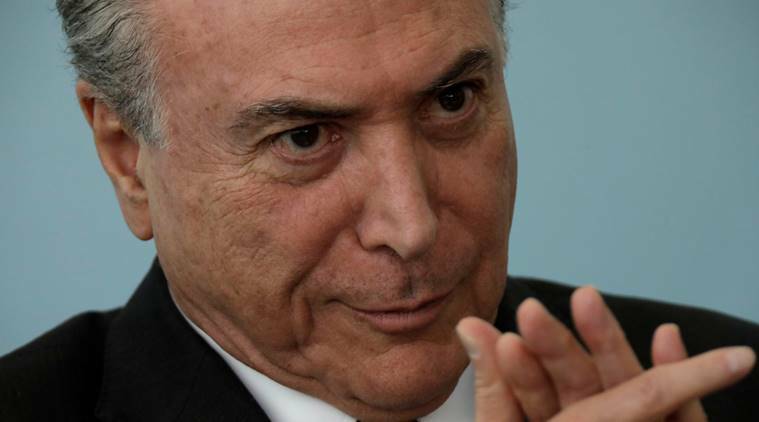 Temer, a lame duck president who is deeply unpopular, said the price of diesel fuel would drop by 0.46 reals (USD 0.13) per liter for 60 days, about a 10 per cent drop compared to the price before the strike began. Temer said the government would pay the difference between the price set by state oil company Petrobras and the reduced cost. Temer also said he was crafting measures to reduce some tolls and establish minimum freight rates, key demands by truckers whose shutdown has brought much of the country to a halt. Congress this week was also expected to debate various measures aimed at ending the shutdown. Whether the changes will be enough to get truckers back to work remains to be seen. An announced “agreement” between the government and transportation unions last week was ignored by thousands of truckers, who continued striking. While Temer spoke today, in Rio and Sao Paulo the banging of pots could be heard, a form of mass booing of unpopular politicians in Brazil. Over the last week, thousands of schools have canceled classes, many flights have been grounded and gas stations have emptied, bringing much commerce to a halt. Through it all, Temer’s administration has struggled to confront the stoppage, exposing a yawning gap between politicians in the capital of Brasilia and thousands of truckers who are key to keeping Brazil running, in part because the commodity-rich nation has no significant rail or canal system to move goods. On Friday, Temer said he would have the army and police use force if necessary to remove thousands of truckers who parked along highways and roads nationwide. That prompted more hackles than fear from truckers. Soldiers made no moves against truckers, though they did serve as convoys for some fuel shipments. On Sunday, Gen. Eduardo Villas Boas, head of the Army, even tweeted that negotiation was the best way to avoid conflict. The price of diesel has risen sharply in recent months as world oil prices have gone up and the real has devalued against the US dollar. The shutdown comes at a time when Brazil is struggling to recover from a deep recession and many people are furious at much of the political class because of a massive corruption scandal that involved inflated construction contracts and billions of dollars in kickbacks.